Have you made Brandied Cherries? 1. Combine cherries and water in heavy saucepan/skillet lge. 2. enough to hold fruit in no more than 2 layers. 3. 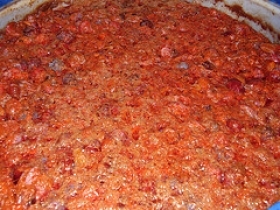 Bring to simmer, cover and barely simmer for 10 minutes, or until the cherries can easily be pierced with a tooth pick. 4. Uncover the pan several times during the cooking and stir very gently. 5. 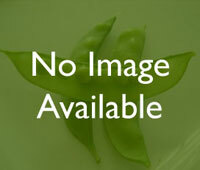 With slotted spoon, remove fruit to bowl. Boil juices until reduced to 1 cup or slightly less. 6. Add sugar and bring to a boil, stirring. 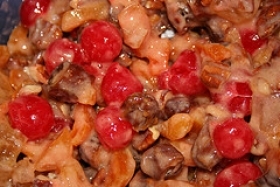 Cover pan and simmer 1 minutes Pour syrup over cherries, cover bowl with towel, and let fruit stand 12 to 24 hrs. 7. 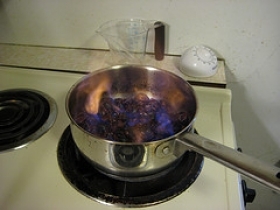 Strain off syrup into small saucepan and bring to boil. 8. Reduce syrup to about 2/3 c. Divide cherries between 2 hot, sterilized pint canning jars and slowly add hot syrup. 9. Fill each jar with Brandy or cognac almost to rim. 10. Wipe rims, seal jars, and fasten with screw rings. 11. Invert jars several times to mis-liquor and syrup and let stand in cool place 30 days.